As I was returning from my older son’s cross country meet just in time to run my younger son to swim practice, there was not a whole lot of time for cooking and no leftovers to speak of. As I reached for the eggs–a favorite quick dinner in our house–I spotted a jar of leftover Greeked-Out Gorgonzola. This dressing is my lighter-but-equally-delicious take on the classic, thick, blue cheese dressing. As I stared at the jar, I wondered how it might do as a pasta sauce. As it turned out, this was a happy experiment that is now one more delicious use for a recipe that was an experiment from the start. As you stir the sauce into the warm noodles, the blue cheese melts and provides a most delicious flavor. The overall dish is kept in check thanks to the base of Greek yogurt. Peas are a great add-in. Sautéed mushrooms would pair perfectly, too. Add a protein of your choose to make the meal heartier. I just love it when desperation breeds deliciousness! This recipe makes four medium-size servings and can easily be doubled or halved. Cooked turkey or ham would be a nice addition to make this a heartier meal. In a large bowl, whisk together the oil, yogurt, Worcestershire, garlic, and salt and pepper, to taste. I use about a half teaspoon of salt and a few grinds of the pepper mill. Stir in the blue cheese and chives, then add a little buttermilk to reach your preferred consistency. Three tablespoons of buttermilk creates a a consistency I like for dressing. You may want it just slightly thinner for using as pasta sauce. Cook the pasta according to the package directions. Drain and return to pot. Pour in the dressing and the peas and cook over low heat until the peas are warmed and the cheese is melted. Sprinkle with chopped chives, if desired. Gorgonzola is one variety of blue cheese. You may use Gorgonzola, Roquefort, Stilton, Maytag or any variety you like. Your favorite pre-crumbled, grocery store brand will work just fine in this recipe, too. For an updated version of Greeked-Out Gorgonzola using a 5.3-ounce cup, which is now more common, click HERE. Thank you, Christie! I appreciate the comment! That dressing sounds divine! Such a simple yet flavorful dinner! I would love to invite you to share this at Mom’s Test Meal Mondays! 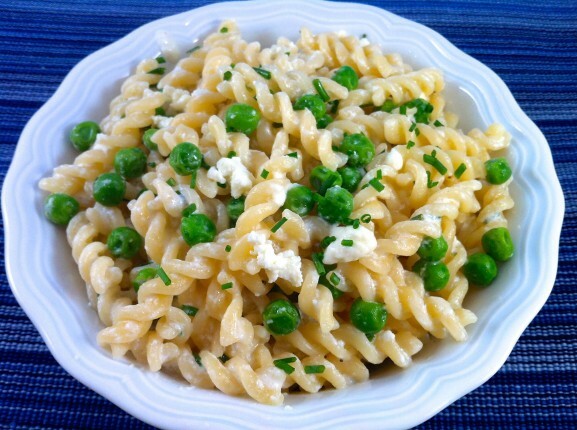 I made a pasta recipe similar to this with blue cheese, asparagus and peas. It was delicious! Thanks for the comment, Sara! Asparagus would be a great addition! This is a gorgeous pasta dish, Ann! I am a big blue cheese fan, too…enjoy!!! The dressing will be a good substitue for full fat blue cheese. Mine was good, not great. I used whole wheat pasta and I just did not like the taste/texture of it. I need to find the Barilla Plus, I like it much better. I also did not have nearly enough blue cheese but I will certainly make this again. Some brands of pasta are definitely better than others, especially when entering the whole wheat and gluten-free territory. I hope you enjoy it even more when you have the pasta you prefer…and more cheese! Like all the ingredients, esp. the Gorgonzola. Must make this. And now a comment about your web site – it’s changed. Yes, my updated site just “debuted” last week. All of the same recipes are still here, there’s just a fresh look and better functionality that should be helpful as the recipe archives continue to grow. I hope you enjoy the changes–and the noodles!